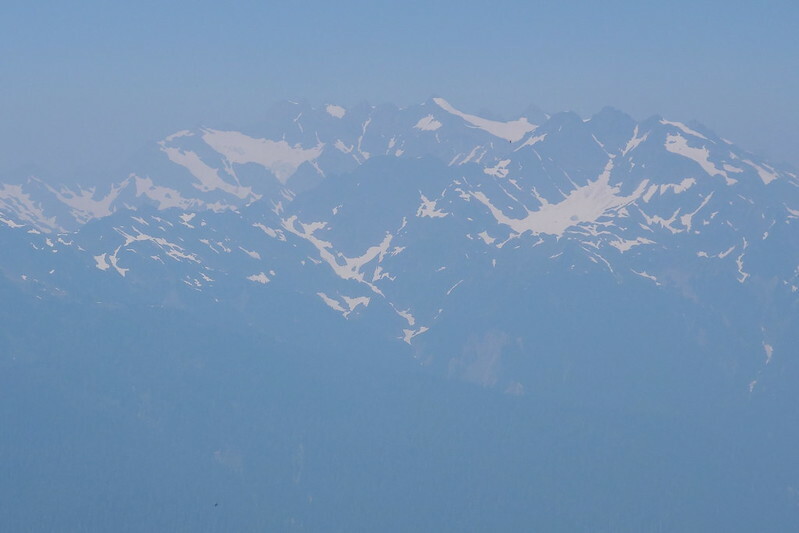 Across the Olympics, Day 11: Do Bears Like Wagner? – Hi, Alpine. Today’s going to be tough. Just 18 miles, but after yesterday, when the last 6 took me four hours, I figure it might take a while. 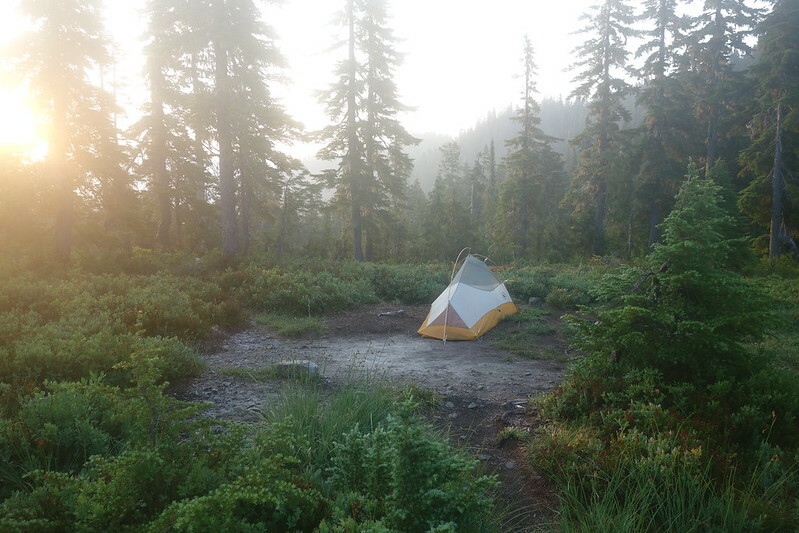 So I get up early, eat breakfast quickly in the tent, hiding from bugs, then set off, back up to Skyline Ridge. 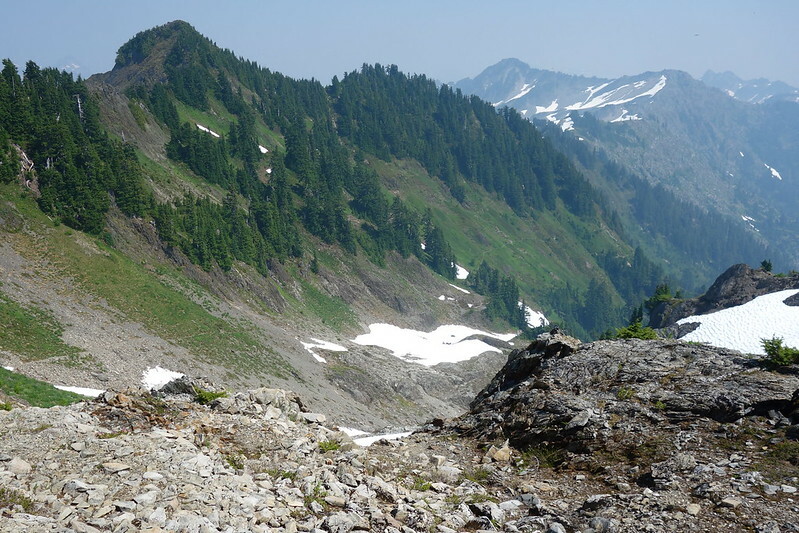 I rejoin the ridge on Beauty Pass, then sidehill south, looking down at the Queets, for half a mile, until the delightfully named Hee Haw Pass, where the trail switches sides to overlook Promise Creek and the North Fork Quinault. 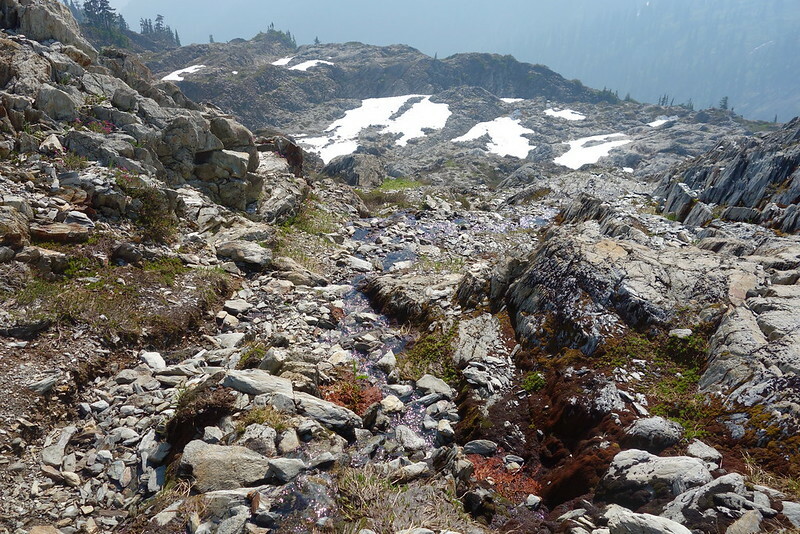 It’s absolutely beautiful: verdant creeks tumble down from the ridge, through blooming heather and barren rock, everywhere bounded by snow, still thick against the summer heat. Mt. 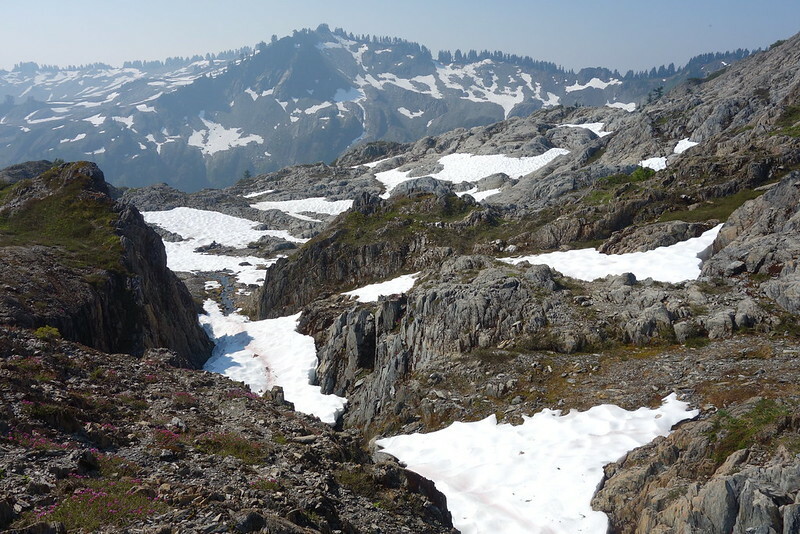 Zindorf stands to the south—just 5500’ high, but alpine all the same. 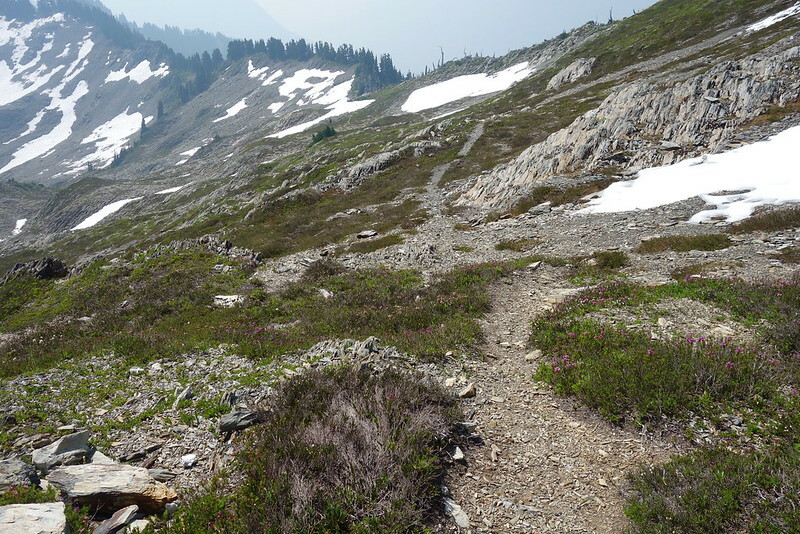 The trail fades in and out—sometimes overgrown, sometimes washed out, sometimes smothered by old avalanches—until it disappears completely in a moonscape of rock and ice. 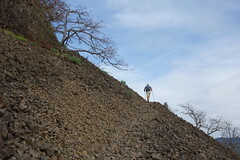 There are cairns here and there, but eventually I lose them, and just follow a set of bare rock seams under the ridge. 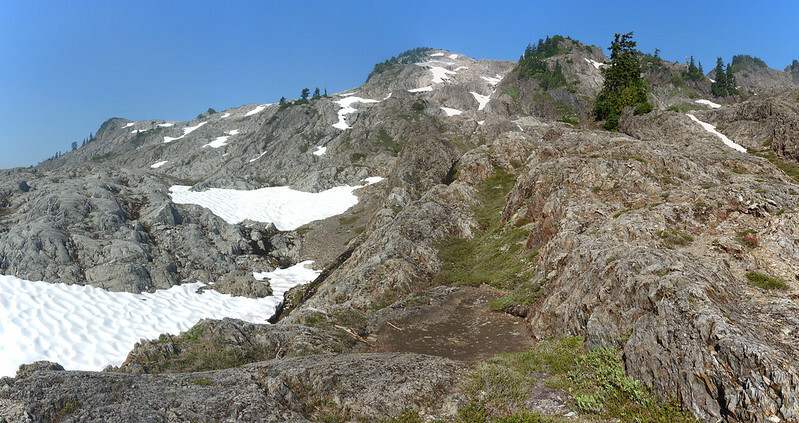 I know I need to climb back up to the ridgetop eventually, and soon I hit a steep wall of snow that forces my hand. I have absolutely no idea where the trail is, or if the trail even exists here anymore. 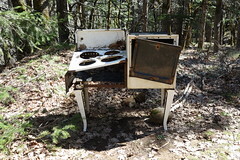 The National Park hasn’t maintained it in decades. 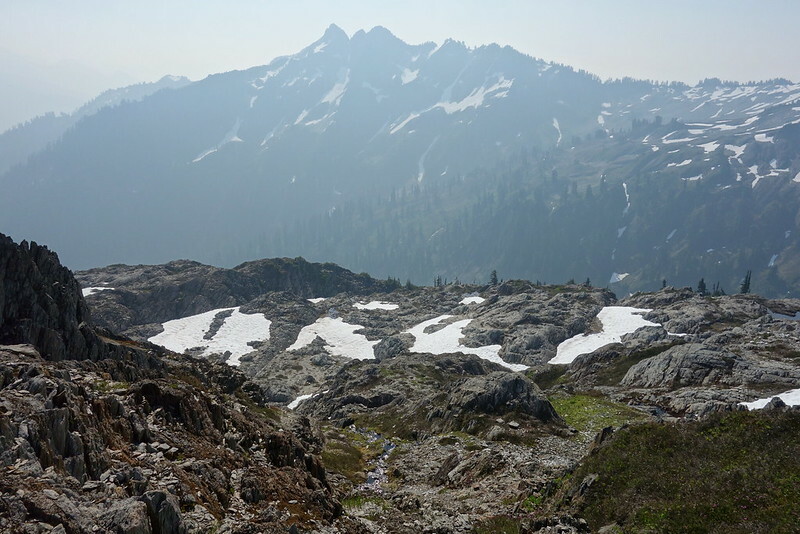 But I know I need to descend a bit on the way to Promise Creek Pass, and so I follow the ridge down, and soon, for the first time in miles, find clear tread. At Promise Pass, things get confusing. 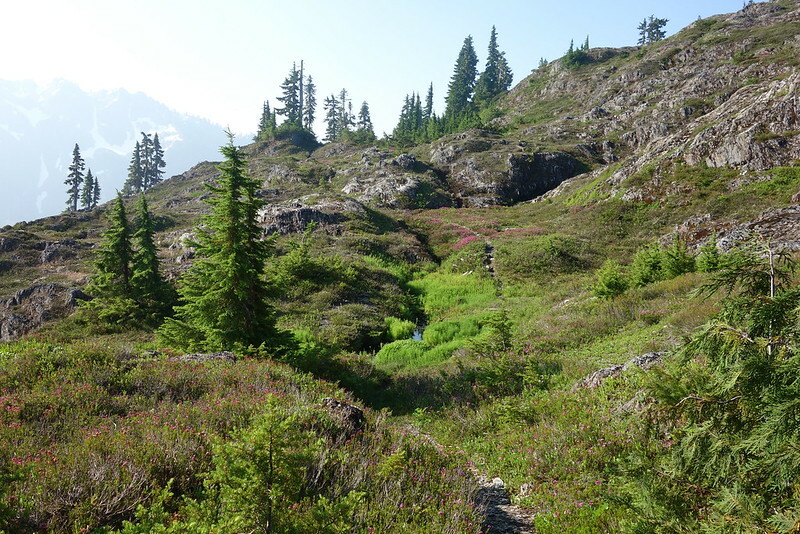 The trail switchbacks steeply into the Kimta Creek drainage, but there are also game trails everywhere, some considerably better used than what I take to be the “official” route. Eventually I’m reduced to sidehilling with map and compass on what I vaguely suspect might be something like the trail. 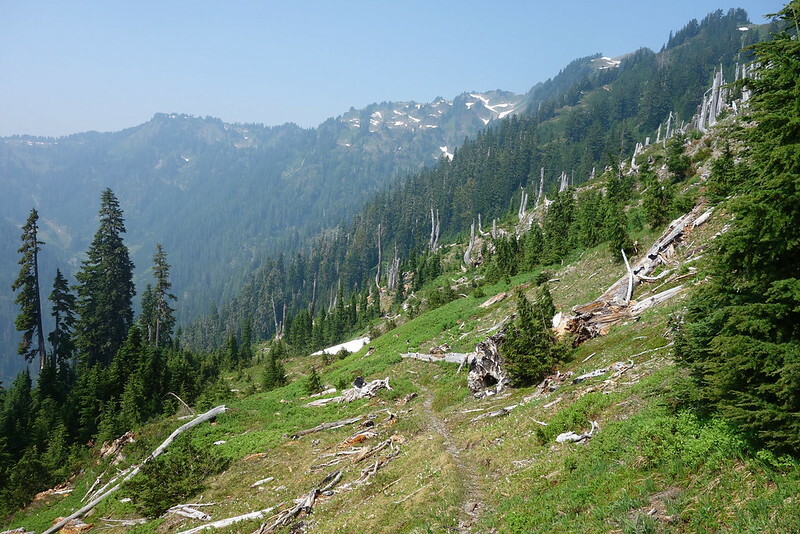 The soil in this section is marshy, and small bits of tread are interspersed with fallen trees, overgrown brush, and snowdrifts that stretch from the ridge all the way down to Kimta Creek. 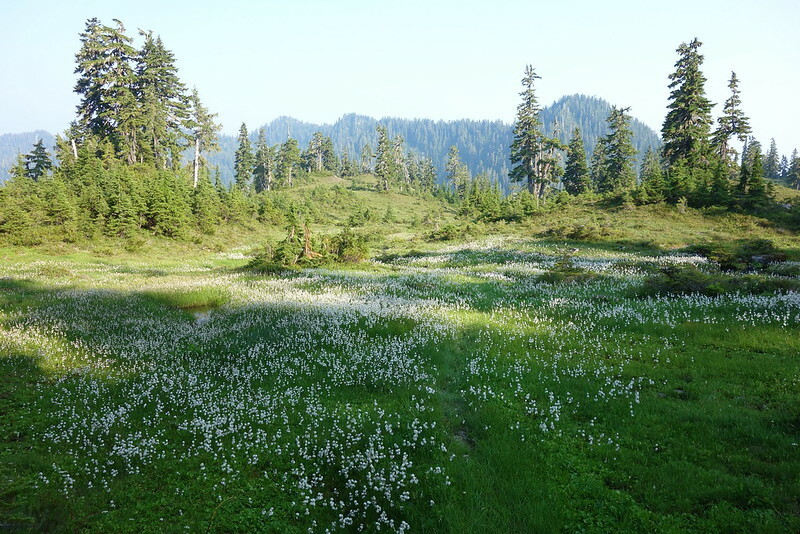 Things improve a bit, though, as the trail descends into the woods on its way to Kimta Basin. The day’s first easy walking. 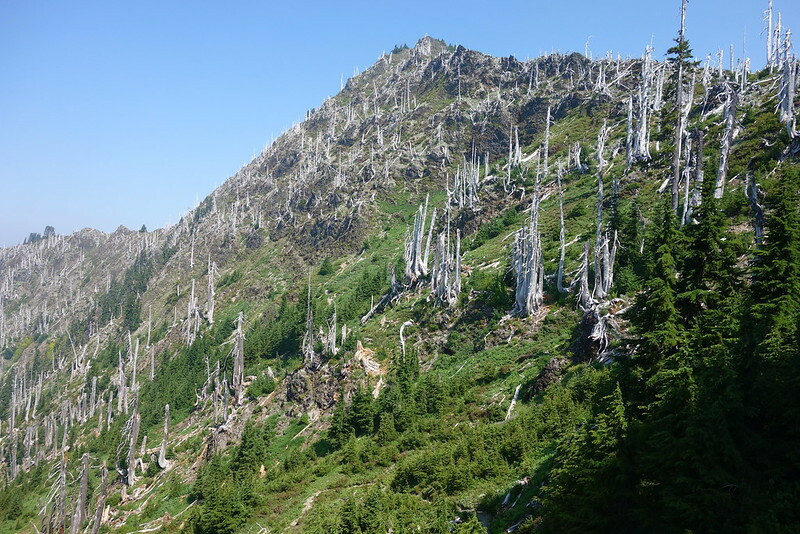 Climbing up to Kimta Pass, there’s a black mass in the middle of the trail, which I mistake, initially, for an oddly shaped bit of blowdown. As I get closer, though, the blowdown starts moving towards me. It takes much longer than it should—I am not, it turns out, a terribly keen observer—but eventually I realize it’s a bear. A very large bear. Moving towards me. I’m not scared, exactly. Dude’s not being aggressive, and in any case black bears basically never hurt anybody, especially when there are no cubs around. (I think there are no cubs around?) But even still, it’s not exactly my ideal situation. 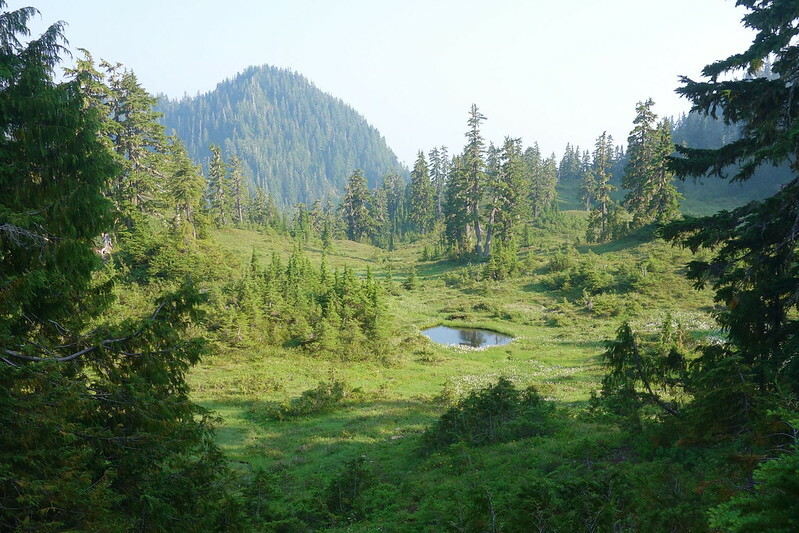 I clang my trekking poles above my head, and do a bit of “Hey Bear!” He stops, unconcerned, and starts biting at the bushes. I redouble the banging, but he doesn’t even look up. The hillside’s too steep to go around, and I don’t want to keep walking straight and risk seeming aggressive. So I just stand a while, clanging my poles with decreasing enthusiasm. It’s not working. Neither is the “Hey bear!” business. What now? I think about the most off-putting things I can do. I could start lecturing it about, I don’t know, ordinary language philosophy. Nothing, in my experience, clears a room quicker than a good old rant about Gilbert Ryle. But I don’t know, it could be risky. Did I hear somewhere that bears are into The Concept of Mind? The next best—or, I guess, worst—thing I can think of is singing. My singing has been unfavorably compared to Vogon poetry. But what to sing? I want something jarring, and that a bear would be unlikely to like. Wagner? I don’t know. Do bears like Wagner? Did Wagner like bears? I feel like dude would probably be on the bear’s side in all this. And then it comes to me, in a moment of serene inspiration: the theme from Ghost Busters. That synth vibrato in the chorus is, at best, an acquired taste. 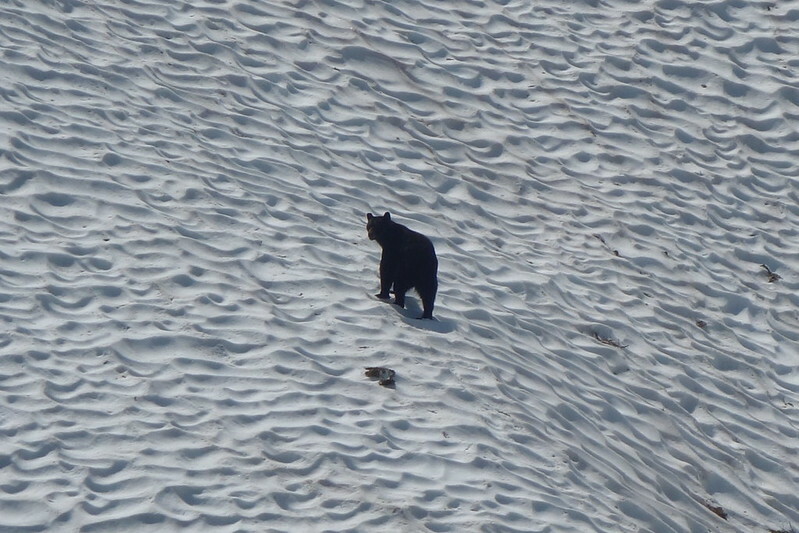 So I start in, and immediately the bear looks up, seemingly sincerely wounded that I would trouble him with such a poor performance, and he begrudgingly walks away, up a steep snowfield. The last push up to the pass is, well, a push. 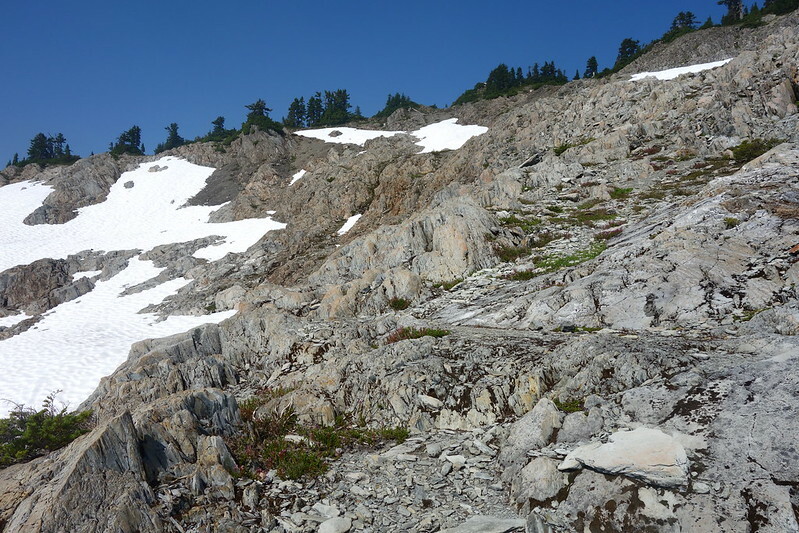 The trail’s covered by a steep, slick snowfield, so I climb hand-over-hand up a rocky outcrop to the ridgetop, then walk back to something that kinda seems like it’s maybe the right way. 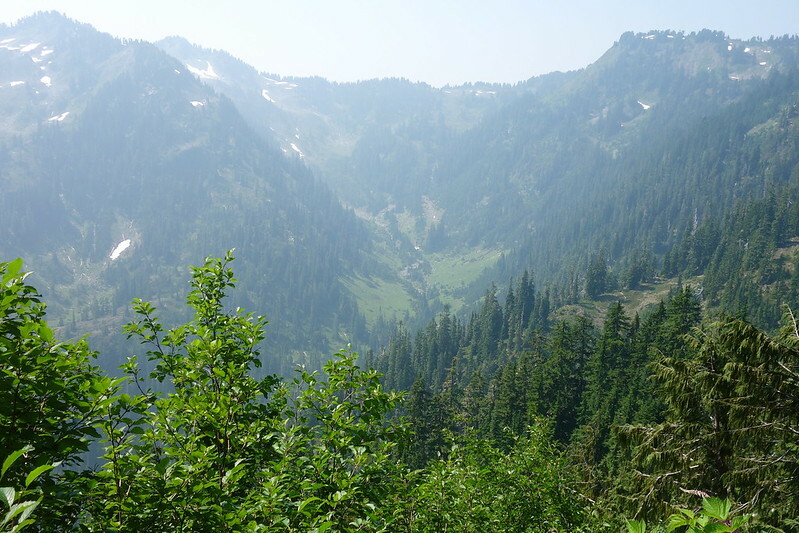 The views back, into Kimta Basin, are absolutely beautiful, as are the views across the Queets to Olympus. 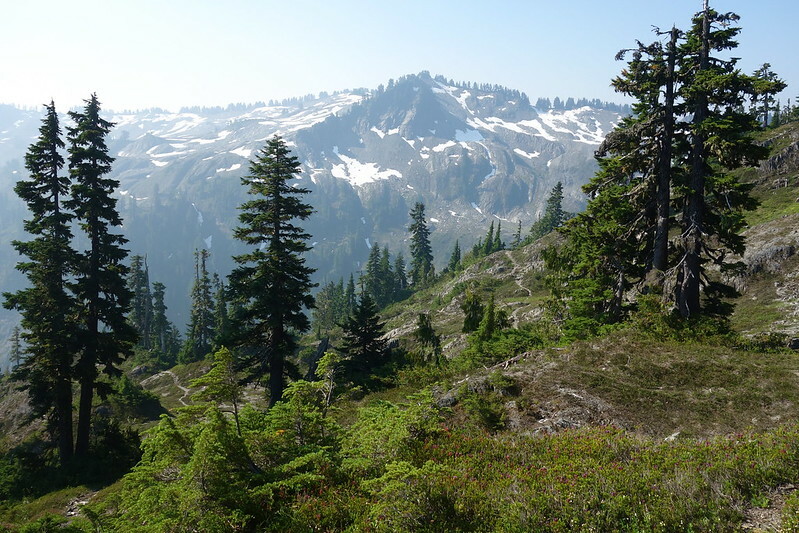 From the pass, the trail descends quickly, almost due south, down the last of Skyline Ridge. First it meanders through a set of beautiful open basins, then slumps into the trees. At some point, I run out of water. 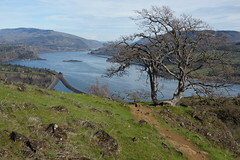 I knew that there was a long water carry today—maybe 13 miles—and so I packed five liters, my full carrying capacity. But it’s been hot, and I guess I’ve been drinking more than usual. Ugh. My map says it’ll be dry for at least three or four more miles. 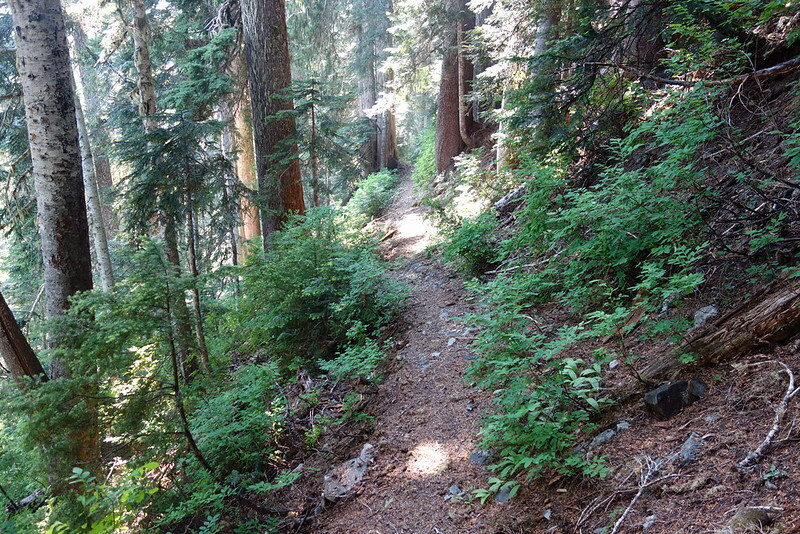 The trail through the woods is well-defined, but littered with blowdown. I bonk. But I guess I’ve learned how to deal with it. 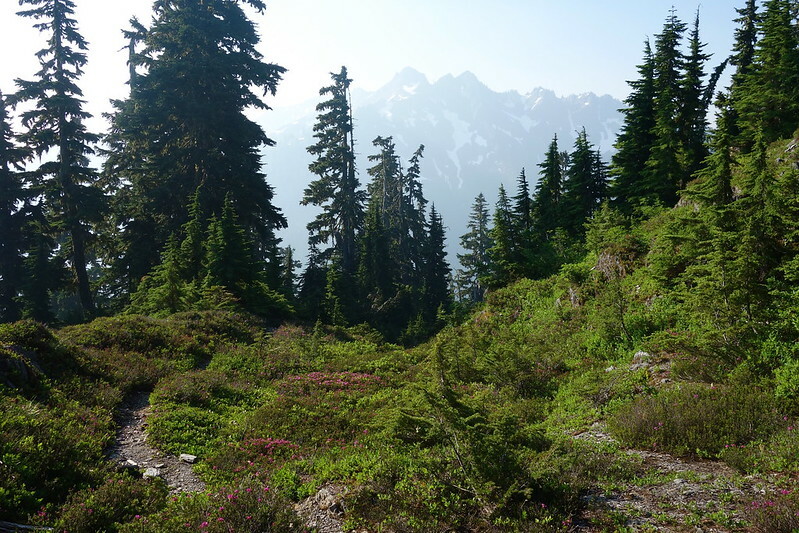 I turn on some old techno, put my head down, and just hike. It’s funny: I always feel strongest at times like this, when I’m at the edge of breaking down. Maybe something to do with knowing that what I usually think of as my edge just isn’t. Just an hour later, I hit water: streams and pools and ponds around Three Prune Camp. I find a fast, cool creek, and lie down in the middle of the trail, drinking liter after liter until my stomach hurts. Then lunch and another liter. It’s like paradise. The bugs aren’t even so bad. Can I just sleep here tonight? The last few miles, from Three Prune to Three Lake, go slowly in that way that the ends of days often go slow. Pointless ups and downs. Molasses miles. 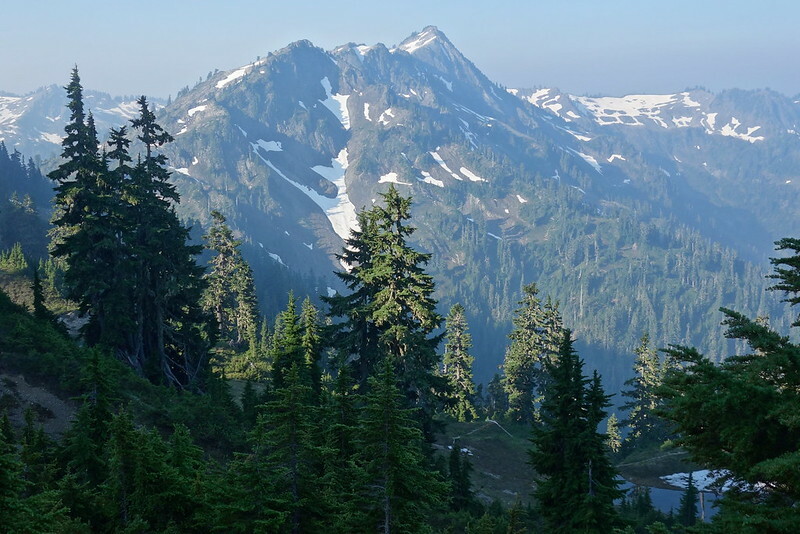 The ridge is less pronounced now—just one crest in a convoluted maze of them—and the valleys are less dramatic too, just small dents in the trees. 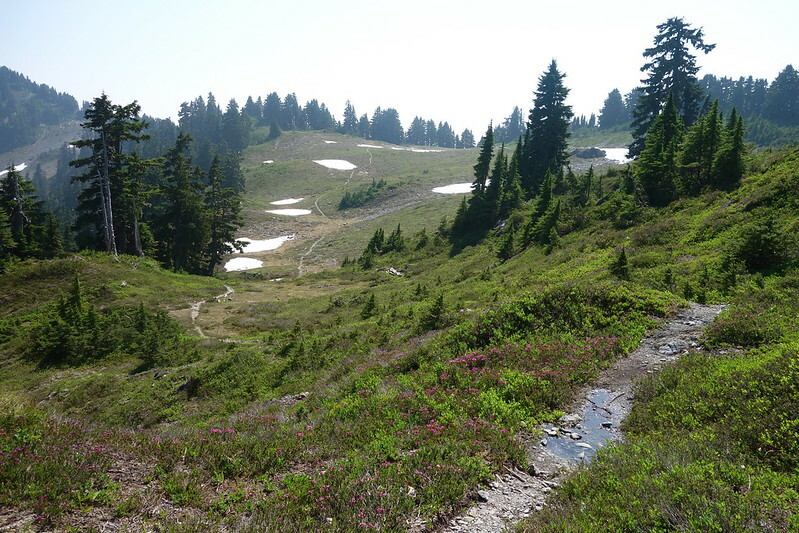 The trail turns through a series of wet meadows and dry woods until finally it reaches the headwaters of Big Creek, then switches back down to Three Lake Camp. Half a mile short, I fall while crawling over a particularly tall bit of blowdown. It’s not bad—just a couple of raspberries and a deep scratch on my shin—but I’m unreasonably shaken by the time I make it to the lakes. 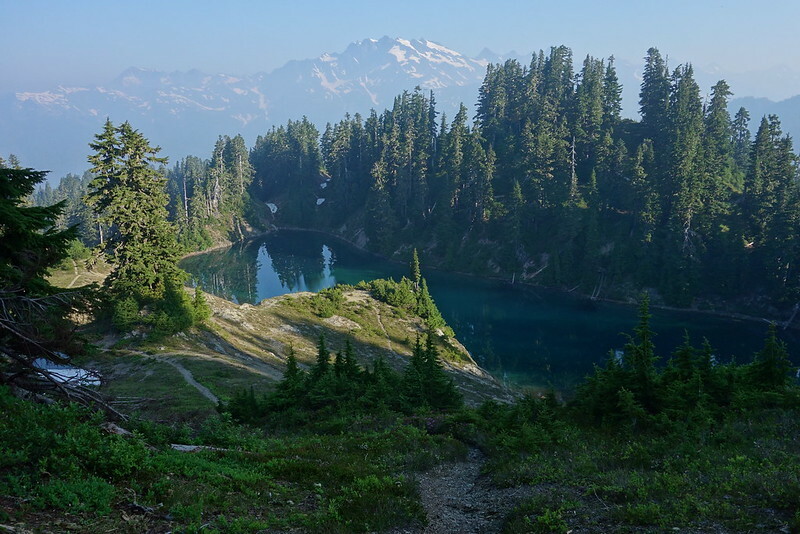 The lakes, though, are beautiful: three ponds set deep in a meadow, in the shadow of Tshletshy Ridge. The whole place is empty. It feels as though it’s been empty for years. 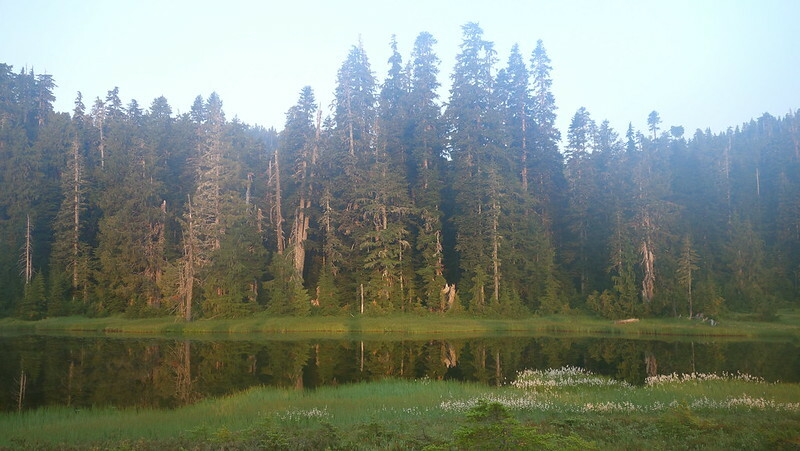 I wash the blood off my legs, set up my tent in the most beautiful spot, then cook dinner in another, watching birds swoop down over the ponds as the sun sets. I guess I made it over the Skyline. I don’t think I’ll ever do that again.